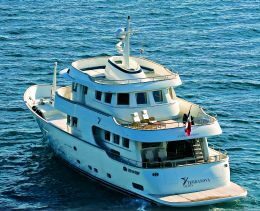 Terranova Yachts is a recent yard on the displacement yacht scene. It brought an interesting proposal to the last Cannes Boat Show, the Explorer 85. The silhouette alone made her stand out among the other vessels at the quay, and a visit aboard confirmed the decisive and original character of this graceful "explorer yacht". 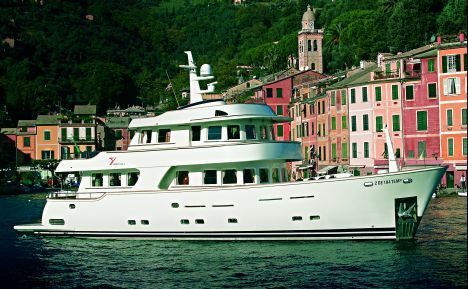 Giancarlo Pedetti, the yard's managing director and also the brain behind this line of boats, has wide experience of displacement hulls, both as dealer and sailor, and his clear ideas led to this coupling of luxury and reliability in an 85' that could be euphemistically defined as a superyacht with a tugboat's heart. It is built in laminated fibreglass with isophtalic resins, monolithic for the quick-works, sandwich for the topsides and deck. As well as a keel with a fairly pronounced skeg, there are various longitudinal reinforcement members laid at 50 cm centres while a steel support for the engines is set in the bottom structure. The hull is of the semi-displacement type, designed by Inigo Toledo at the Barracuda Design studio of Madrid, and gives a maximum speed of 16 knots. Cruising speed lies between 10 knots at 1200 rpm - with a very low consumption of roughly 50 l/h - and 15 knots at 2000 rpm with maximum consumption of 120 l/h. The engine room well explains the philosophy behind the design: the two 700 HP MAN engines are housed in a spacious and rational environment. There are special devices for bypassing the cooling fluids from one engine to the other or using the propellants as bilge pumps. On this subject it should be pointed out that the whole pumping gear - already fairly oversized - is also doubled: sewage, dirty water, bilges, autoclaves, diesel etc. The choice of mechanical motors - the Kobelt controls at the various stations are electronic but have an electromechanical transducer - means maximum reliability and gives the possibility of having mechanical levers in the engine room which can be activated manually and without current. This feature, together with the manual diesel pump for filling the daily tank, ensures that you can always be under way. The generator units, compressors and battery chargers are also doubled. The desalination system supplies 4320 litres of fresh water daily and the 117.000 btu conditioner sends warm or cool air to every space aboard. A workbench and the space for a sink complete this ordered environment which we regretfully leave to continue to the upper decks. 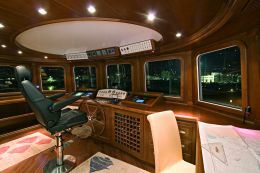 The main deck, in spite of two wicker armchairs in the cockpit for contemplation, reveals another "expedition" aspect of the boat: a 500 Kg crane in the bow, which can launch the 50 HP outboard inflatable dinghy in all weathers, and two chunky electric winches (optionally hydraulic) for handling the 180 Kg anchors, each with 120 metres of chain. Access to the crew's quarters is from this section of the deck: two double cabins with private bathrooms, somewhat sacrificed to the big anchor chain guide-tubes. Access to the saloon is by a sliding door in glass and steel. 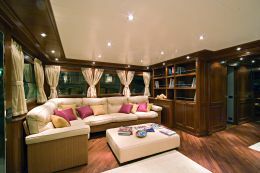 The interior strikes you with the sobriety and elegance of the décor, common to all the yacht's interiors: cherry for the walls and furniture, curtains and sofas in natural fabrics, lacquered wood ceilings, flooring in iroko, an extremely classic style. Corner sofas with a low central coffee table provide areas for conversation, watching films on the big plasma screen or for reading one of the great many books from the Explorer's library. The windows make the space very bright, like the separate dining room forward of the quarter, accessed by way of a small landing. A soberly inlaid table and eight chairs welcome guests to a room that evokes yachts of a far greater size. The adjacent galley is laid out in a rational U-shape where double sink, six plate electro-ceramic cooker with aspirator hood, dishwasher, washing machine, 500 litre-plus fridge/freezer (compressors in engine room), work surface and plenty storage space are set in Schiffini aluminium and steel. A door leads to the deck without passing through the living area. Opposite the galley there is a staircase down to the night area and up to the bridge. 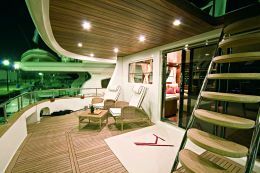 The lower deck has a fairly classic layout which can, however, be varied according to requirements. You can have a fifth cabin or turn one of the existing ones into a sauna, gym or study. 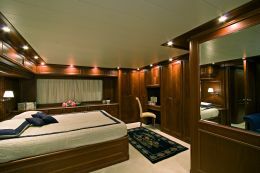 Amidships, next to the engine room and extending the whole width of the beam, the owner's cabin has a king size bed, various wardrobes, a dressing table and a conversation corner with two blue leather sofas set at right angles. 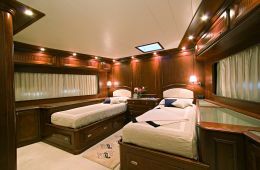 There are three guest cabins: a large one forward with double bed and sofa, and at the sides two opposite cabins with twin beds and a third foldaway where required. 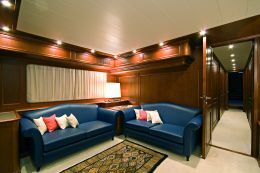 The décor is the same everywhere: cherry wood, light-coloured moquette, lacquered ceilings and sober, vaguely neoclassical boiseries. Of course each cabin has a private bathroom with shower area in marble and glass, raised level WC and bidet and a marble surface for the washbasin. Rather democratically, the four bathrooms are more or less the same, without much difference between the owner's and the guests'. Continuing to the upper decks we come to the bridge: an adjustable seat for the helmsman, chart table, double drawers for instruments, with sliding closure both for aesthetic reasons and to avoid too much light when under way at night. For the various controls there is a line of analogue instruments for both engines and systems. Navigational equipment is complete: GPS, radar chartplotter, autopilot, echo sounder, log, VHF, satellite telephone, SSB. From the wheelhouse you have great all-round visibility while the external stations are used for manoeuvres in dock. Aft of this room there is a small saloon with sofa, plasma TV, day-toilet and stainless steel retractable washbasin. 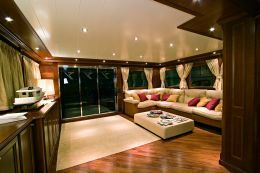 You can follow the steering of the yacht, watch a film or go onto the surrounding 360° "Portuguese Deck". It is higher than the quay and, once protected by wickerwork, is a favourite place for outdoor meals or sunbathing in absolute peace. 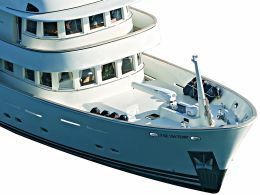 The flying bridge above is accessed by an internal stairway: a spacious locker in the fake funnel contains all the sundeck cushions. The various aerials are also mounted on this bridge, including Sat TV. Superyacht has sailed a lot in the Ligurian Sea on Explorer 85: the absence of noise and vibrations, the manoeuvrability at sea and in port, and these 15 knots, not too fast but fast enough to see Portofino become Lavagna in a reasonable time, the feeling of calm aboard: it all evokes the advantages of an unusual and fascinating style of sailing aboard a vessel that is absolutely suitable for both the domestic horizons of Tigullio and for others far more distant and exotic.